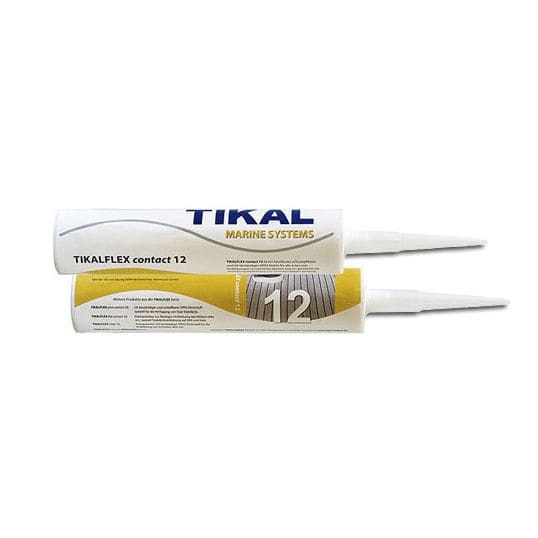 TIKALFLEX contact 12 is a shrink-free, very strong, weatherproof MS polymer adhesive for all kinds of bonding assignments in the maritime or mobile environment. This MS polymer adhesive is suitable for permanently elastic, fixed, vibration-resistant bonds, can be used to compensate tolerances and can be sanded when cured. TIKALFLEX contact 12 can be used for applications above and below water. TIKALFLEX contact 12 hardens on exposure to humidity, can be coated with normal varnish after hardening and shows good resistance to nitric acid, caustic soda, oil and diesel.